PHOENIX — After visiting an animal rescue center while on vacation with her family to Big Bear Lake, California, a Yuma student was inspired to lead a class project to benefit Arizona’s wildlife. As a fifth-grader at Gowan Science Academy during the 2016-2017 school year, Mabel Humphrey participated in Genius Hour, an initiative based off a Google program that allows the company’s engineers to spend 20 percent of their time pursuing passion projects. The concept has been adopted by some educators, and during Gowan Science Academy’s Genius Hour, students are encouraged to think of ways they can benefit the community. Mabel’s idea was Penny Wars — a competition among classrooms to raise the most money by donating spare pennies, all in the name of helping wildlife. Mabel made posters to promote the three-week event, and her efforts paid off. Penny Wars raised more than $500 that were donated to the following animals through the Adobe Mountain Wildlife Center Auxiliary: $150 bobcat, $100 peregrine falcon, $100 Mexican free-tailed bats, $100 golden eagle and $50 desert tortoise. 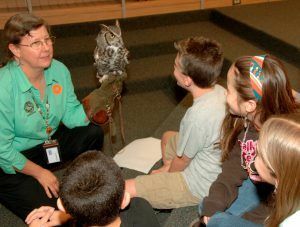 The Arizona Game and Fish Department’s Wildlife Center provides care for sick, injured, confiscated and orphaned native wildlife as well as education outreach programs throughout the state. Donations made to the Wildlife Center are deposited into the department’s Injured Wildlife Fund and used to support the care of the animals brought to the center. You can help support sick, injured and orphaned animals at the Wildlife Center by donating online or texting “CRITTER” to 41444 from your smartphone. In the photo above, Sam Huselton, a wildlife education outreach coordinator for the Arizona Game and Fish Department, talks with students about the state’s wildlife.